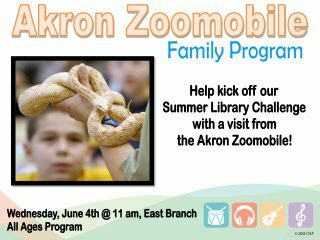 The Akron Zoo comes to the East Branch to help kick off our 2018 Summer Library Challenge! Learn some amazing animal facts and get the chance to see three special animals in person! Kids, teens and adults are all invited to join us for this family program.